If you know anything about me, it shouldn't come as any great surprise that I'm a fan of AMC's Hell on Wheels TV series. After all, I'm fascinated by early industrial engineering (did somebody say steam engines?) and black powder firearms are a hobby of mine. Besides, this show revolves around the building of the U.S. Transcontinental Railroad, and I just happen to be writing a steampunk series called Aboard the Great Iron Horse. Hell on Wheels is about the adventures of a former confederate soldier (named Cullen Bohannon) who sets out to take revenge on the men who murdered his family. He traces them to a temporary railroad town named Hell on Wheels and ends up staying there to help finish the railroad. The town is so named because it's little more than a tent city for railroad workers. As construction moves along, they pack up the town and bring it with them. But don't think that means Hell on Wheels is just a quiet little campground. This town makes Tombstone look like Happyville. Amidst the saloons, whorehouses, and casinos are ex Confederate and Yankee soldiers, Native Americans, and ex-slaves known as "freemen" struggling to find their place in a world where they're still not truly considered equal, and working for the railroad doesn't feel that much different than slavery did. In that respect however, all citizens of Hell on Wheels are equal. Hell on Wheels is almost entirely populated by the dregs of society These people wouldn't find a place in a civilized town anywhere, and they all have one thing in common: no one's place is assured, and fates can change in an instant. This series isn't for kids. It's filled with drama and violence in a way that almost rivals Game of Thrones, save for the fact that sometimes the good guys win in this show. But don't count on it. There's plenty of tragedy to go around. In fact, one of the things I like about Hell on Wheels is that it's hard to tell from one episode to the next which characters are heroes and which are villains, and there's no way to predict who's going to come out on top. The tension is ever-present and cliffhangers abound, so binge-watching will be the most rewarding way to enjoy this show. 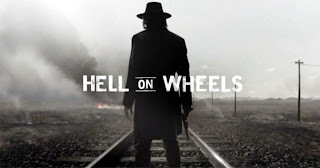 Hell on Wheels just started its fifth season, and the reason I'm writing this now is because AMC has announced that this is the show's final year. You can watch Hell on Wheels free on AMC, starting with Season One, or you can own it permanently on Amazon for a small fee per episode. I believe the first four seasons are also available on Netflix.